Now we know the next proper instalment in the chainsaw-loving, Xbox-exclusive is coming in just over six months, Microsoft has decided to wet our appetites/torture our love for the series with a new trailer. Entitled 'Tomorrow', it's certainly business as usual for the series. A mashup of action (namely new muscle-bound protagonist JD Fenix hightailing it away from what looks like some rather adrenaline-infused monsters), some emotional reflection (we finally get a glimpse of gravel-chewing, bandanna-sporting veteran Marcus planting a tree while a mournful cover of Simon & Garfunkel's The Sound of Silence plays in the background (by Disturbed, no less). New developer The Coalition (who have taken over development duties on the series following the departure of creators Epic) is clearly trying to keep things familiar while adding in a few new elements (the debut footage at E3 last year is clearly going for more of a horror vibe). 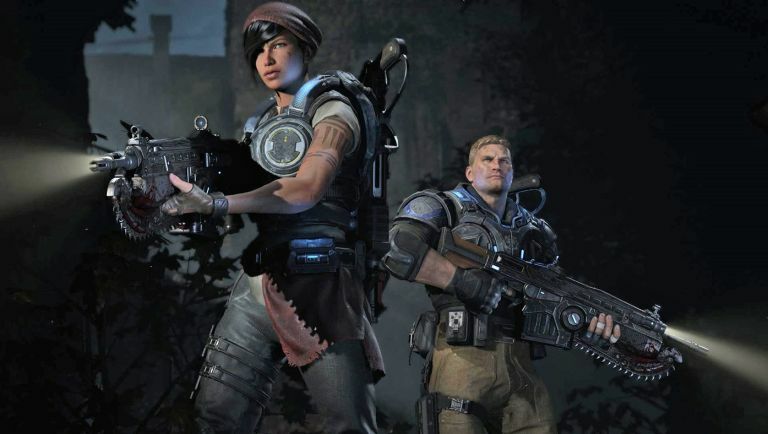 Set 25 years after the events of the original trilogy, Gears of War 4 will see Marcus Fenix' son fighting to survive on a world now ravaged by powerful storms and a new government that's oppressing the remaining survivors of the Imulsion Countermeasure as much as they're trying to protect them. Also looks like the Locust (or something very similar) is preparing to rise up and kick off a new war. Cue men (and women) with massive guns and huge jaws. To tidy you over, the multiplayer beta for Gears 4 kicks off on 18 April for those that bought Gears of War: Ultimate Edtion. Gold Live members will then get the chance to join the beta on 24 April.